Jump in the shower, turn on the water, put your head under the spray and there's something touching your legs! 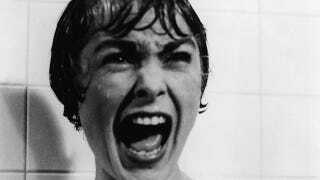 For the unlucky characters in Psycho, that thing is a murderer — but for most of us it's just the shower curtain. Why does it do that?! The minute the shower starts going, the curtain wafts inwards, playfully wrapping around your back and legs like a horny shroud. The annoyance of the curtain has puzzled many a physicist - and provoked many a fight. No one quite knows why shower curtains behave the way they do. There are a lot of theories. One holds that the hot air from the shower rises, and cold air near the floor blows in to fill the void, taking the shower curtain with it. Some brave soul provided evidence that that theory was wrong by taking an ice cold shower and still getting pawed at by the curtain. There's the good old Bernoulli effect theory, which holds that the movement of the water causes movement of the air in the shower. The air rushes by the shower curtain on one side, lowering the air pressure on the inside of the curtain so the relatively higher-pressure air outside the curtain "blows" it inward. There's also the Coanda effect. If you've held the outer curve of a spoon under the flow of a faucet, you've felt the Coanda effect. The water conforms to the shape of the spoon, which isn't that unusual, but if you let the spoon move freely (while still holding it up) the spoon will be drawn into the water, not pushed away. As water droplets move along the curtain, they could draw the curtain inwards. The best insight into the Shower Curtain effect comes from David Schmidt, who won an Ig Nobel Prize for his work. When he did a computer model of how the spray from a shower head moves air inside a shower cubicle, he showed that a vortex develops. The vortex is horizontal, meaning it would look like a sort of jar rolling on its side, drawing the shower curtain along with its motion as it rolls. Despite this being the best evidence yet for why shower curtains seem to crave human flesh, more work needs to be done to get a conclusive answer. Physicists would be willing to do it - but they're all currently in the bath.